For Cal Lutheran’s long-serving first football coach, the announcement in late March that the Los Angeles Rams will base their training on the Thousand Oaks campus makes a fitting twist in a story that started nearly 55 years ago. Although many know that the Dallas Cowboys franchise called Cal Lutheran its home away from home for 27 summers, they might not be aware that a famous former Ram had a hand in bringing America’s Team to the university. Now 82 and retired from coaching, Bob Shoup remembers the day in 1962 when a limo drove onto campus. Chauffeur-driven cars being a rare sight on the then-rustic grounds, Shoup stepped away from the tennis class he was teaching to approach the automobile. He immediately recognized the passenger as Glenn Davis, a Heisman Trophy–winning ball rusher who’d been voted to the Pro Bowl 12 years earlier while playing for the Rams (based then, as now, in LA). Davis had been asked to scout the campus as a possible summer training site for the Cowboys. The athletic facilities were primitive in those early days, said Shoup, so he decided to tout the Conejo Valley’s fine climate. Later, Dallas Coach Tom Landry (pictured at left) came to campus to look things over on a rainy, cold December day when the field had turned to mud. “There wasn’t anything good about that visit,” Shoup recalls. To everyone’s surprise, the Cowboys chose to train at the fledgling college. And for 26 years until their departure in 1989, under president and general manager Tex Schramm and Coach Landry, the Cowboys embraced the community. Even after a day of drills, players attended community events and mingled with the locals. Dallas’ bright blue star shone on the Conejo and, as a result, Shoup was able to recruit football talent. As Dallas got better, Cal Lutheran got better, said Shoup, who coached the Kingsmen to the 1971 NAIA championship. It was a golden time, he recalls. Others have their own treasured memories. Here are a few. Giving the Cowboys their physicals was a tall order. That job fell to Lucy Ballard, H’96, Cal Lutheran’s director of health services. The Cowboys contracted with the campus clinic to examine vets and rookie hopefuls to determine if they were healthy enough to play. “Oh my gosh. The excitement was big,” said Ballard during a recent interview in her University Village home. 2-inch Ballard stretched her arm as far as it would go to raise the height rod over the Pro Bowler’s 6-foot-9-inch frame — to no avail. So, she grabbed a nearby chair and climbed up on it to get an accurate measurement. A news photographer happened by and memorialized the scene. That shot ran in the newspaper and later was displayed at Los Robles Hospital, where the exams took place. But Ballard stepped up to get it exactly right. — Lucy Ballard retired in 2004 after 35 years in campus health services. For Jim Evensen ’85, Cowboys’ training camps were a summer school where he majored in life lessons. During his high school years, Evensen landed a coveted but low-paying spot as the team’s ball boy. He and his peers toiled from 7 in the morning to 7 in the evening carrying sweaty shoulder pads off the field and repairing helmets. He recalls earning $300 for the entire camp. One day in the locker room, star quarterback Roger Staubach summoned Evensen and handed him a 10-dollar bill. “Go rinse off my car, Legs,” Staubach said, using the nickname players gave the gangly 5-foot-10-inch, 120-pound teenager. When Evensen saw Staubach’s car was spotlessly clean, he tried to return the money. For some African-American players, especially the rookies, Thousand Oaks was the only predominantly white community they had been in. Kids raised in the Conejo Valley saw few black residents. At first, Evensen said, the black players and the white kids in the locker room would study each other. As the summer progressed and people got to know one another as individuals, the relationships grew comfortable. The diversity the team brought with it spread to the greater community. — Jim Evensen’s late father, Jim Sr., known as “Doc,” was a popular Cal Lutheran geology professor. Even 20 years after she left Cal Lutheran, Karen (Reitan ‘65) Anderson impressed skeptics with the university’s deep ties to the Cowboys. 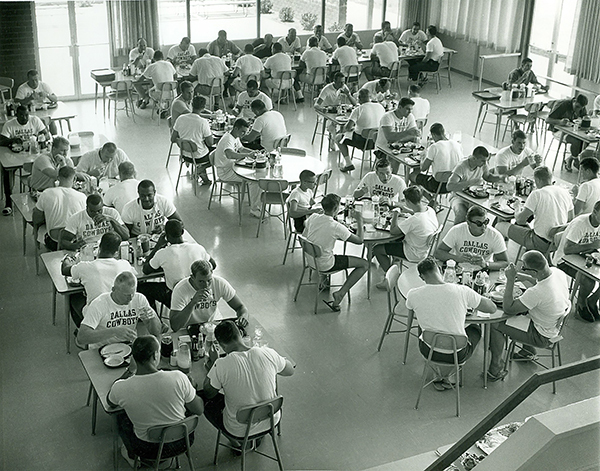 Anderson worked as a secretary in the Athletic Department starting when the Cowboys first made camp in 1963. Her job kept her too busy to watch practices — in part because the team’s staff often asked her to type up their paperwork in addition to her CLU duties. Eventually she and her husband, Ed, moved to the Central Valley. Anderson became the cheerleader coach at Tracy High School and took her girls to a cheer camp in Santa Barbara sometime in the mid-1980s. “A lot of these kids had never been out of Tracy; I wanted to give them a college experience,” she said. Anderson arranged for the squad to spread out sleeping bags and spend the night in the locker room at CLU. Some parents did not believe her when she told them America’s Team used this same facility. After a little exploration the doubters came to believe, Anderson said. They discovered the big blue Dallas star in the tile of the locker room floor. — Karen Reitan Anderson and her husband, Ed, have served as student recruiters for Cal Lutheran. Judy (Westberg) Blomquist ’64 literally made hundreds of connections with the Dallas Cowboys. For one ’60s summer, she was hired as the switchboard operator in a tiny room off the foyer of “Mt. Clef Inn,” the team’s summer lodging. Far from the latest in telecommunications technology, it was a “one ringy dingy switchboard from the Lily Tomlin sketch,” Blomquist said. The players — especially the rookies — were homesick and lonesome for conversation, she recalls. “There wasn’t much to do in Thousand Oaks then, and they didn’t have cars,” she said. So they would hang over the ledge on the Dutch door to her office and chat with her. When the Cowboys left campus that summer, they expressed their appreciation by giving her the smallest team jersey they could find — size 50 long. — Judy Westberg married her classmate Warren Blomquist, who went on to become a high school football coach in Roseville. Beneath his kiddie-pool-sized cowboy hat, Tex Schramm had a head for business innovation, recalls Larry Horner, a Thousand Oaks City Councilman from 1974 to 1990 and a former mayor. And underneath his stoic expression, Cowboys Coach Tom Landry possessed a great sense of humor, Horner also remembers. The late Coach Landry had a joke for every occasion and a nickname for every player on the roster, he recalls. Horner and his wife, Betty, rank team president Schramm among the shrewdest business people they’ve encountered. “When you met him, he was fun-loving but, when you really talked to him, he had the vision that went beyond being a football executive. You’d think he was an economics professor at Harvard,” Horner said. Schramm, who passed away in 2003, introduced to the NFL instant replays, microphones for the referees and flashy cheerleaders. The Horners marvel at how the openness of the team’s Cal Lutheran summer camps allowed them to get to know these iconic national sports figures. — The Horners are founding members of Cal Lutheran’s Community Leaders Association. Larry Horner was awarded the university’s Exemplar Medallion in 1991 and spoke at Commencement in 1981. Dr. John Tomec may have been the Cowboys’ orthopedic surgeon, but it was the team who gave him a good leg pulling. Educated at the Johns Hopkins University Medical School in Baltimore, Tomec came to Thousand Oaks in 1966. After serving the Kingsmen as team doctor, he was hired by the Cowboys in 1968 for what became a 24/7 job during training camps. Dr. Tomec and his wife, Dottie, agreed to host a private barbecue for the veteran players at their Lynn Ranch home in the early ’70s. After a lavish meal with steaks, flown in by the team from Omaha, the players left for an after-party at Orlando’s, a Thousand Oaks Boulevard watering hole, Dr. Tomec recalls. Before turning in, he checked on Tiger, his Great Dane. Tiger, it seems, had vanished from his outdoor run. Dr. Tomec was pretty sure he knew who had absconded with the pooch. Sure enough, Tiger was back home the next morning after accompanying the Cowboys to the nightclub. — John Tomec, who served as CLU team physician from 1967 through 1992, was inducted into the Alumni Athletic Hall of Fame in 2006. He and Dottie donated the John Tomec Endowed Scholarship at Cal Lutheran. Sources: These recollections were taken from personal interviews in the spring of 2016.